Apologies for the lack of content this last week. Everything's kind of been backlogging on me. I'm slowly getting back in the swing of things, and answering your emails - sorry if I have not got around to you, yet. Many of you will know I was really sick a couple few weeks back. I had a really cacky week, where I was too ill to even be coherent on-line, let alone leaving the house. It was rubbish. But the one shining moment of not-rubbish came on the first occasion I managed to stumbled over to my PC, to check my email account for the first time in several days, and found the first in a sequence of pleasant surprises. 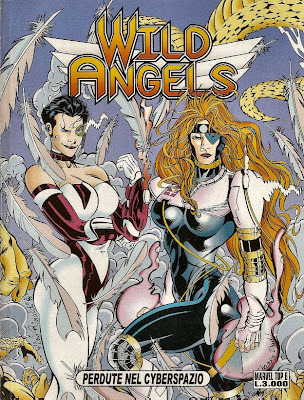 Several weeks back, you''l remember,I put up a post about a Marvel UK book called Wild Angels (Which was announced in the latter days of Marvel UK, but never actually made it to print here in the UK). It was a book starring Dark Angel and Wild Thing: Nikki Doyle, put together by Nick Vince and Pino Rinaldi. Having only ever seen adverts in other Marvel UK books, and the one page of artwork which was solicited in the Bodycount preview book, I was keen to hear more about this book. Especially after I had heard a rumour that it HAD been put out in Italy. I am to believe that the title at the bottom reads as 'Lost in Cyberspace'. It's slightly smaller than US comic size, printed in black and white, and has been published as part of Marvel Italia's Marvel Top 6 line. It's not bad at all. This little volume prints in full all four issues of Wild Angels. It does, however, present them in Italian (Stumbling block number 1). Yes, that was something which, in my hurry to get hold of the book, I had neglected to think about. Luckily, it just so happens that a friend of mine worked as a teaching assistant in Italy (Two different spells), and while she's kind of busy right now doing another degree, has promised to have a go at doing a translation for me. Which is kind of her. So, as soon as I get that I'll try to paste it up on this Blog, to let a few people know what it's all about. The very same day as I received my copy of Wild Angels through the post, I received another email (Pleasant surprise number 3). To be honest I was a little spaced out by illness that day, and I don't think I quite realised what I was reading, at first, when I checked my email that day. While I'd been checking my hit statistics for the site earlier that day I had noticed that somebody had been translating the Blog into Italian, via the wonders of Google (I do this from time to time, out of morbid curiosity of seeing just how far this site reaches out across the world). It turns out that one Italian visitor in particular had been doing doing that. Because this email was from Pino Rinaldi. 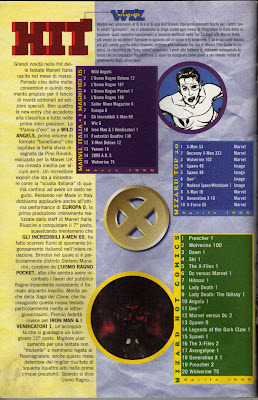 The text on the left, reading between the lines of crude translation I received from Altavista Babel Fish, points out that Marvel Italia's titles dominate the top ten titles, and that Wild Angels (Conceived for Marvel UK and having laid unprinted for several years) takes the top spot. Sounds like a good time for comics in Italy, when the rest of the industry was in decline. I've had a couple of conversations with Pino, now, via email. He comes across as a genuinely nice guy, and has given me permission to put up some of the artwork he sent from the book on this Blog. It all looks pretty good, actually. My main complaint about Wild Thing: Nikki Doyle, as a series, was that I never really felt that the artwork was a good match for the book. 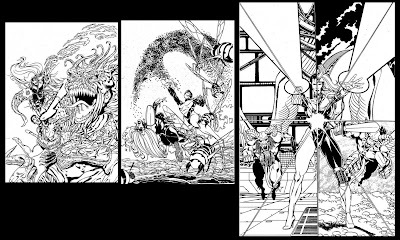 The work which Duke Mighten and Antony Adhikary did certainly isn't bad, but it is a very distinctive style - certainly not one so often seen in American Superhero comics. It often felt like a bit of a compromise on both parts, artist trying to fit style and style conflicting with artist. It didn't work quite as well as I feel it might have. I think Pino Rinaldi's work here might be the first time we saw Nikki Doyle drawn outside of that series, and I really like the expressiveness Rinaldi's art brings to the character. All in all, from an art point of view, this book looks pretty solid, and I would have loved to have seen it in full colour. 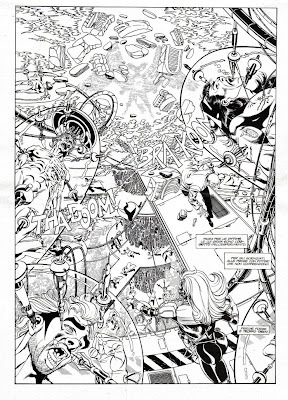 This double page spread is the second and third pages of the first issue, with Dark Angel breaking into a Mys-Tech test facility. The level of detail is great, especially on the faces of the subjects. Heck I like this one as artwork in own right, let alone where it fits in the book. So there you have - Success! Thanks to everybody who has helped in tracking this one down, and a special thanks to Pino Rinaldi, for letting put the images up.